Versatile data transport services on a stable, high-capacity fiber network. + Ethernet Private Line (EPL) and Ethernet Virtual Private Line (EVPL). + Bandwidth of up to 100Gbps. + High-capacity transport, with speeds from 10Gbps to 100Gbps. + Reliable, point-to-point service on secure, dedicated connection. The next step in growing your network. + Secure connectivity with dedicated speeds and low latency. + Extensive network ideal for wireless backhaul. Need help deciding? Let’s chat. Why choose Arvig for Wholesale Services? We not only get you what you need, we give you something more. With speeds of up to 100 Gb., confidently serve your networks and users. Wavelength, Dark Fiber, Ethernet—you select the bandwidth and delivery. We do it all: engineering, permitting, locating, utility work and directional boring. Every Arvig fiber connection is engineered for minimum latency, packet loss and jitter. We’ll create you a solution that ensure seamless data transfer and access. 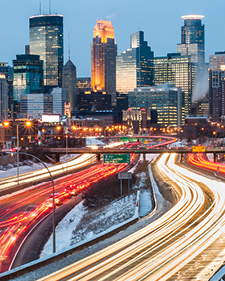 Arvig has fiber to Twin Cities data centers including Flexential, 511 Building, Data Center Edina, Databank Eagan, One Neck, Syxtera, US Internet, Monticello and Vaultas (St. Cloud and Alexandria). From the first call to the last mile, Arvig is with you.